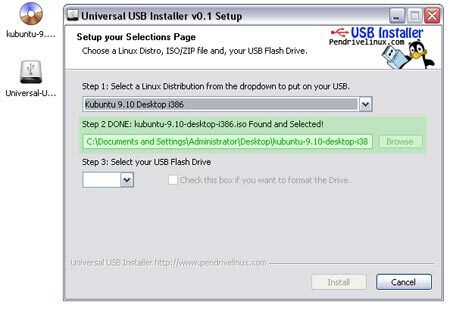 Universal USB Installer is a Live Linux USB Creatorthat allows you to choose from a selection of Linux Distributions to put on your USB Flash Drive. The Universal USB Installer is easy to use. Simply choose a Live Linux Distribution, the ISO file, your Flash Drive and, Click Install. Other features include; Persistence (if available), and the ability to format the flash drive (recommended) to ensure a clean install. Upon completion, you should have a ready to run bootable USB Flash Drive with your select Linux version installed. Updated to include Ubuntu 10.10 Netbook Remix, Lubuntu 10.10, Ubuntu – Xubuntu – Kubuntu amd64, and Server Install versions. More Live Linux Distributions will be added as time permits. Feel free to contact us to submit recommendations. A Linux based version of this tool is in the works for those Die Hard Linux users who prefer not to use Windows. For now, you can visit the "How to install Linux from a Linux CD" section for individual tutorials. Notes: If you run Universal USB Installer from the same directory containing an installable ISO, the script will autodetect the ISO and bypass step 2 once the proper Distro has been selected.